This story was originally published in the 2018 issue of the Vancouver Foundation Magazine. Engaging at-risk youth has been a long-time concern of the Haida First Nation. 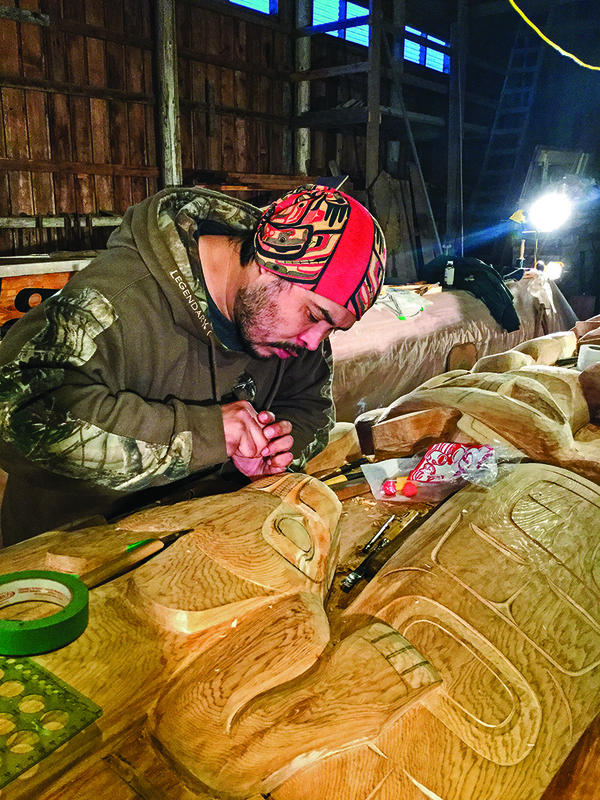 So when the Old Massett Village Council (OMVC) and the Tluu Xaada Naay Society approached Vancouver Foundation in 2016 with an application titled “Honour: Health to Hand,” it was to support a program that would teach youths skills and disciplines based on Haida art and culture, using carving and design as the principal medium. This culminated in eight Haida youths earning certificates from NorthWest Community College and acquiring traditional woodworking skills from Haida master carvers, in a project called Totems in the Forest. Supported by a $75,000 grant from Vancouver Foundation, the project also saw the raising of Haida Gwaii’s newest monumental pole on Taaw Hill by the east bank of the Hiellen River on June 21, 2017. The ceremony drew over 1,300 locals and visitors. In addition to empowering at-risk youth and engaging the greater community, the 51-foot cedar totem pole (a stunning interpretation of a totem that stood at Hiellen village from the early 1800s until 1945) helped encourage repatriation and reconciliation among a people who no longer live where Hiellen is located. “It was an unforgettable, joyous, and emotional day for everyone to watch the first totem raised in this area in almost 200 years,” says master carver Kilthguulans Christian White. Strictly as a work of art, Totems in the Forest would see master carvers Chief 7idansuu, Jim Hart (who holds the original pole and endorsed the project), and White preside over a new interpretation of the historic heritage Hliialang’inagee gyaa’ang Totem by Sqiltcange. However, the deeper purpose of the project came in the form of eight Haida youth: an equal split of males and females from age 19 to 29, who would help craft the totem under a 27-week cultural training/ skill development initiative. “We commenced work in the winter of 2016 by stripping off the bark of a big red cedar that had been carefully sourced, flattening the back of it, then hollowing it out,” says White, who was aided by his son Vernon and brother Derrek. Project partner Northwest Community College provided safety and training courses as well as entrepreneurial instruction that resulted in the apprentices’ designing and selling t-shirts commemorating Totems in the Forest. “The college really helped them build up their portfolios and give them transferable skills,” says White. The youth each received a set of carving tools and other supplies to assist them in the program, while a local toolmaker explained how to use and maintain them. As the carvers worked in the Tluu Xaada Naay Society longhouse and carving shed, the Old Massett Culinary Arts Program provided them with food. “It was a remarkable community effort,” White adds. The carvers also had the opportunity to experience a heritage artifact firsthand by taking rubbings off the original Hliialang’inagee gyaa’ang Totem, sections of which lay in storage sheds. This pole strongly influenced the design of the new totem, which was inspired by the Grizzly Bear hunter story, as well as raven and eagle stories, and includes three watchmen. Upon completion, the totem was transported by truck to Taaw Hill, and the carvers arrived at the raising ceremony by canoe. Now that Hiellen Longhouse Village has a direct connection to one of the more iconic Haida Gwaii artifacts of the past, White is excited about the lasting benefits of the Totems in the Forest project, which was named The Solstice Pole. “Many of my apprentices have since gone on to work with other artists and are taking courses to further prepare them for careers,” he says. Biron, now 30, concludes, “This is exactly the sort of initiative that helps get our young people working again. Providing skills training in combination with honouring Haida tradition is vital to us, and I only hope that more projects will follow.” To which SnowDymond adds, “Our government-funded pole project is reflective of our need for our Aboriginal culture to be honoured and respected, without condition, and in perpetuity.